Bunions are a very common podiatric issue with many people (especially women) developing the big toe deformity as they age. When a bunion develops, the big toe will begin to point towards the other toes as opposed to straight. The result is a bump on the joint of the big toe which eventually becomes swollen, inflamed and painful. If non-surgical treatments for your bunion haven’t adequately relieved the pain, surgery may be the next step. 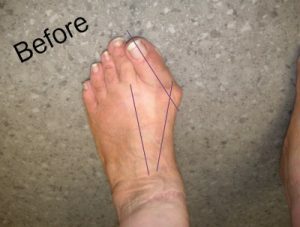 We discuss what to expect from bunion surgery. Your podiatric surgeon will talk you through any issues specific to you prior to surgery. As with any surgery, your general health will be assessed prior to undergoing a surgical procedure for bunion correction. Some medications may need to be ceased, which will be discussed with you by the anaesthetist. Fasting will be required prior to surgery; how long for will be advised by your anaesthetist in a consultation leading up to the bunion removal surgery. Bunion removals are performed as an inpatient procedure in hospital, and may occur on a day surgery basis or with an overnight stay. You will be unable to drive safely following the surgery so it is important a ride home is organised beforehand. Most of the time, the surgery is performed under a general anaesthetic. Healing from bunion removal surgery takes 2-3 months, however a degree of swelling may persist for up to 12 months after surgery. This process will be monitored periodically by your podiatric surgeon. Avoid getting your stitches wet by protecting it in the shower and not swimming until it is advised safe to do so. A post-operative sandal will be prescribed for wear that will prevent your toe from accidental knocks and scrapes in the first few weeks that will impact recovery. 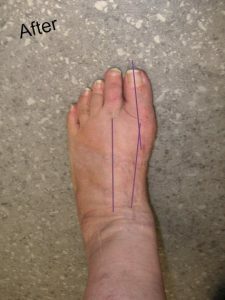 Crutches or walking frames are not usually necessary after bunion removal surgery and patients are usually permitted to put full pressure on their foot straight away. It is best to take it easy and avoid standing as much as possible in the first few weeks after surgery. Pain after surgery varies between patients individually, however it is usually controlled through a combinations of paracetamol and codeine-based painkillers. The anaesthetist will discuss the most appropriate pain relief medication to suit your needs after surgery. Ice can be used to reduce inflammation and swelling early on in the recovery, however you should expect some swelling to remain for the full recovery period. Patients are usually required to commence self-physiotherapy exercised as home a few weeks after surgery. This allows for normal movement and strength to be regained in the big toe after the operation. Dr Andrew Knox is one of the few certified foot specialists and podiatric surgeons in Australia. If you think bunion surgery could be right for you, organise a consultation today by calling 08 9383 3851 or booking online. Disclaimer: This blog is intended for general information purposes only. Any surgical or invasive procedure carries risks. Before proceeding, you should seek a second opinion from an appropriately qualified health practitioner.